Magic Mushrooms: Effective for Treating Depression? 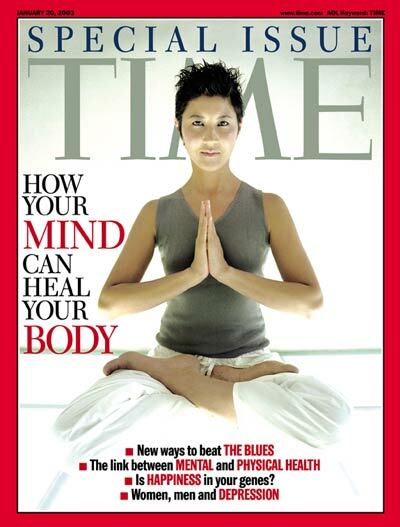 A recent article in The New York Times Sunday Review voiced an opinion about using psychoactive mushrooms to treat depression. Dubbed “magic mushrooms” when they became a recreational drug in the 1960’s, they were made illegal in 1968. For a long time, little research was performed on the mushrooms, and the drug found in them, psilocybin. However, researchers have recently begun studying the uses of psilocybin and its affect on the brain. The results coming out of these studies suggest that psilocybin may be useful in alleviating depression and a myriad of other psychological disorders, but it remains to be seen if they are a reasonable and effective treatment. The image displays neurological activity in the brain without mushrooms (Left) and neurological activity with mushrooms (Right). 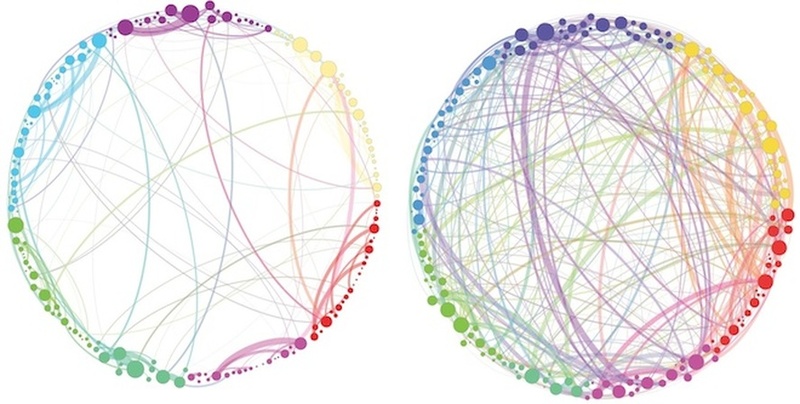 The brain connections on the right are more diverse and represent new forms of neural communication that occur during the use of mushrooms - Could this produce a therapeutic effect? Many people with depression are lost in a cycle of negative thinking. They follow the same thoughts and react in the same way to stressful situations, creating a pattern of behavior not only on the outside, but also on the small scale inside the brain. Neurons rely on specific neural pathways that don’t always help the individual when it comes to mood. Psilocybin, the chemical in the mushrooms that is responsible for hallucinations, is now known to push the brain into using different neural pathways. Recent studies using brain imaging illustrate this when comparing the brain activity of both normal brains and those on psilocybin. Using the drug to induce the brain to choose new neural pathways may aid individuals with depression in that it pushes the brain out of its current patterns which may be adding to depression. There have been many studies with emerging research showing the positive effects of psilocybin. They are suggesting that psilocybin may be useful in treating depression, memory loss, greater recall of positive memories, reducing obsessive compulsive symptoms, cluster headaches, PTSD, and the psychological aspects of terminal cancer. This research has many believing that psilocybin should be studied for use as an antidepressant, but I am a bit skeptical. Depression is an amazingly complex disorder with causes ranging from genetics to interactions of medications. Two people experiencing the same depressive symptoms can have very different causes. Neural pathways can play an important role, but it is not the only aspect of depression. Given the vast amount of knowledge about depression that is known by scientists today, I think relying on psilocybin in mushrooms to reroute neural pathways as a cure is a bit much to ask. Also, given that antidepressants provide a boost in neurotransmitters which encourage the production of new neurons, I’m not sure resorting to an illegal substance is necessary. Perhaps as more research on psilocybin comes in, it may prove to be an effective tool to use in conjunction with more traditional treatments. Until then, I don’t think it should be considered an option, and I would certainly not recommend that a depressed person try psychoactive mushrooms in an attempt to lessen their depression. Growing up in a rural community in the foothills of the Appalachian Mountains, I remember hearing stories of folks going on mushroom harvests. For the most part, if my memory serves me, I don’t recall anyone going on one of them ‘Magic Mushroom’ hunts. For the record, I have never been on a ‘Magic Mushroom’ hunt, and I am not currently using, nor have I ever used any form of illicit drugs. I have never had a taste of alcohol. I have never used prescription pharmaceuticals in any other way than their intended purpose. As close to under the influence, or high on anything, I have been is probably on over-the-counter cold medicine. Therefore, I cannot speak from personal experience on the effects that drugs or alcohol might or might not have on me. I have seen the effects of substances on others, and I must say, quite frankly and somewhat sadly, that there are some people I prefer to interact with when they are under the influence. I have found, since my high school days, that some people are just more tolerable to be around drunk than when they are sober. I am sad to say that, because it seems to reveal that certain people may have a chemical deficiency or dependency issue and may not even realize it. It is with no doubt in part due to the chemical make up of their brains. Just as our brains control our appetites for all things, their brains crave what may be lacking or what it appears to be lacking. Could it be that people with dependency issues on every level crave what they do the most because of an assumed missing element whether it's physical, chemical, or mental? In my example from earlier as a high school student, one classmate that really stands out in my memory was Kevin. Kevin was always a real jerk to me, as well as to others, and he was a real classic example of a bully. I am of an age when bullying was not the hot-button issue that is today. Bullies have always existed and always will, but not too many people really cared back then. Kevin would push all the right buttons to get into an altercation with anyone he felt was beneath him, be it physical or otherwise, while he was sober. However, when he was drinking, a completely different personality shown forth and he was just a calm, relaxed fellow that you might even want as a friend. As the years have gone by and I have matured both educationally and practically, I believe that many individuals have something missing in their lives. In fact they may even realize that something is missing, but they just don’t know how to fill-in or replace what is missing. So they try many things until they find what works. I am not referring to finding something to make them forget what’s missing in their lives or bodies; I mean they may find what really works. Who are we to say what works for someone else? If majic mushrooms work, who am I to judge?